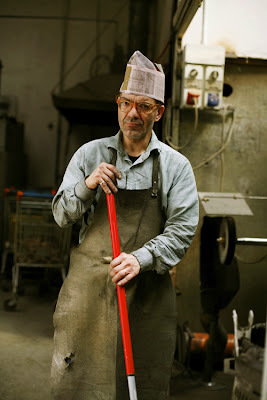 Comments on "Metalworks Plant, Milan"
Love the portrait of the sweeper. Lighting,pose,composition. Excellent. The stuff they make is terrific as well. I love the egg bar! What is the name of this operation and where is it in Milan? i believe your calling is portraiture... your chronicle of beautiful people in beautiful clothes is nice, but i feel where you really shine and what i find most interesting are your shots of everyday people in their work environment. keep it up, i think you're onto something. this wonderland is absolutly charming. think it is like a dying trade, you'll be seeing less of this in the future? this man gives me hope for a one day happy and eccentric marriage, and it's all in the hat and glasses. 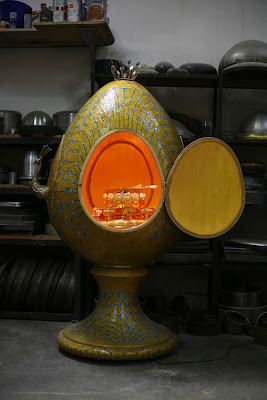 What an fantastic egg! Like looking into a secret fairytaleworld, specially with that small crown on the top! It reminds me of a fairytale I loved (and still do)when I was a kid, and his simply perfect paperhat reminds me of my grandma who always made those for me and my cousins. Beautiful pictures! What a gem you found. And the newspaper hat, now I wouldn't be surprised if I saw it appear in a Kris Van Assche show. I don't think it is usually open to the public but I think it was open because of the Salone. I made a set of those hats in fluorescent paper and added pleated and folded fans to them like plumes. The collection was inspired by the peacock. The hat is a tradtional Japanese printer's hat that they wore to use to keep the ink off their hair. Currently working on a set in organdy. I was there too...it was really cool, very enchanting...fairy-like kind of place...and the creations actually moved! 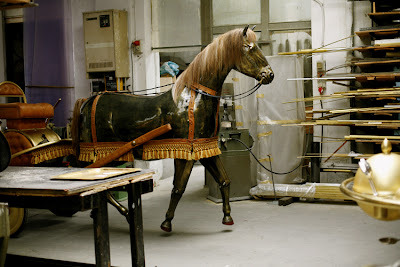 I think that you visited the Teatro alla Scala workshops, where the handmade works for the production are created. Saw a hat like that on the street in Barcelona last month. Love your pictures! I absolutely agree with Stephanie here. I really admire your shots of "real" people, who look as though they've got a different story to tell. They're so much inspiring than the fashion show crowds, all of whom dress to get snapped anyway. One newspaper hat is worth a thousand Thom Browne trouserlegs, if you ask me. More, please. Lovely, Sart. The horse and the hat! It looks like, well, dreamland. Or a very cool museum exhibit. I also love these photos and the modest, hidden stories behind them, even when they don't get that much explicit response. As stephanie s describes it above, it feels like some of your most expressive photography - if I may say so without sounding like a presumptuous ar$e.